Faster and more intuitive than MS Project, the Smartsheet online work execution platform is the easiest way to create Gantt charts for all of your project and work management needs. With over 78,000 brands and millions of information workers that trust Smartsheet to get work done, it’s easy to understand why 96% of customers say they would recommend Smartsheet to a colleague. With its easy-to-use, familiar spreadsheet interface, teams can quickly create Gantt charts in a few easy clicks. Plus, Smartsheet works with the tools you already use, so you won’t miss a beat. Share your work with key internal and external stakeholders and attach files and information in context with your Gantt chart, creating one central location for project details. Empower team members to manage their work from anywhere at any time, and roll up multiple Gantt charts into a real-time dashboard, providing a view into status across projects. It is so easy, so intuitive. Every project is unique and different and Smartsheet allows us to really tailor the needs to the specific client and the team using it. Break down complex project timelines into manageable tasks and organize them by project phase. Easily drag and drop Gantt bars to adjust your timeline. Underlying dates automatically adjust. 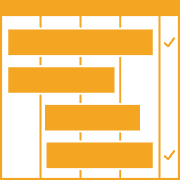 Set durations for each task and then assign dependencies to ensure proper order of completion. Keep tasks organized with color coded Gantt bars, organized by phase, task type, or task owner. Track conversations right in your Gantt chart to ensure everyone is on the same page. Reduce manual work by setting specific column types, like checkbox, date, contact, and symbol. Automatically notify team members and stakeholders of upcoming due dates and milestones. Highlight critical path with the click of a button, so you know which tasks must be completed on time. Share your project with internal and external stakeholders to ensure visibility. Attach files and key documentation right to your Gantt chart project plan to keep details in context. Identify milestones on your Gantt chart to provide a view into progress and ensure you hit important dates. Set clear expectations and increase accountability by assigning tasks to individual team members. Import existing work from Excel, MS Project, Google, and Trello, and, export to PDF and PNG files. Work how you want to by easily switching between grid, Gantt, calendar, and Kanban card views. Provide stakeholders with a high-level view of key metrics and progress on real-time dashboards. 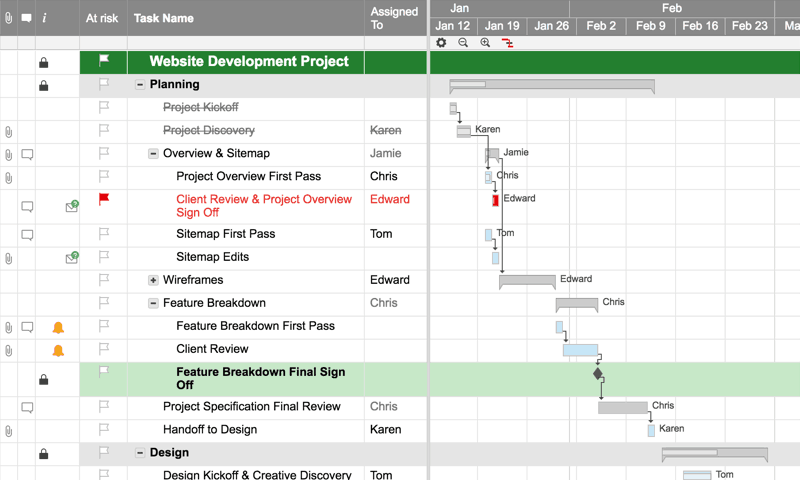 Allocate resources to tasks within your project plan, and track progress and workloads right within your Gantt chart. Use the Smartsheet mobile app for Android and iOS devices to access and manage work from anywhere, at any time. Keep work connected with integrations in Smartsheet, like Google, O365, Dropbox, Salesforce, Jira, and more. Select a Gantt chart template below to get started quickly. Plan, track, and visualize tasks at every phase of your project. Assign tasks to team members, and quickly identify the impact of project delays to rapidly recover from setbacks. 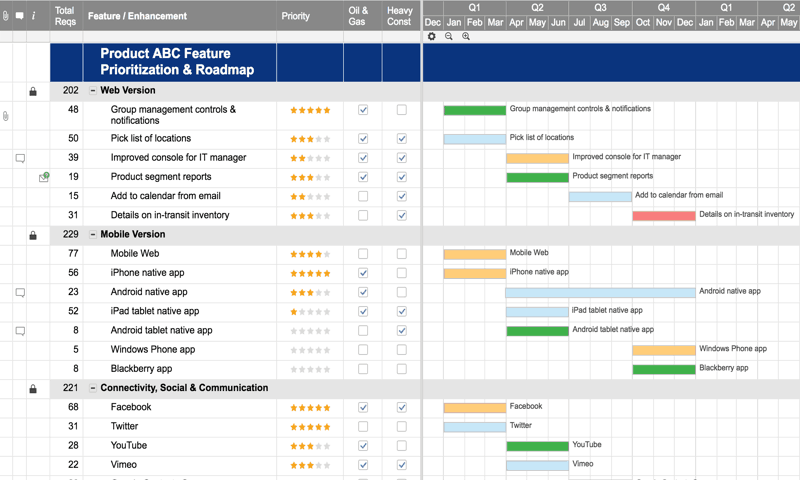 Outline your product roadmap with a timeline view of feature development and delivery. Align your team’s efforts with stack ranked features and use weighted scoring to assess priorities. Keep software development projects moving forward by tracking sprint progression in one location. Create milestones, assign tasks, and view how individual tasks and sprints are tracking. Stay on top of web projects by managing all tasks on one Gantt chart timeline. Keep all wireframes and client emails centralized in one location to ensure visibility. Execute on all tasks throughout an M&A transaction. Share the project plan with your team or external auditors to collaborate in real time and create an audit trail. Manage multiple sales opportunities across all stages of the sales processes. Gain visibility into progress and identify at-risk opportunities to quickly mitigate issues. 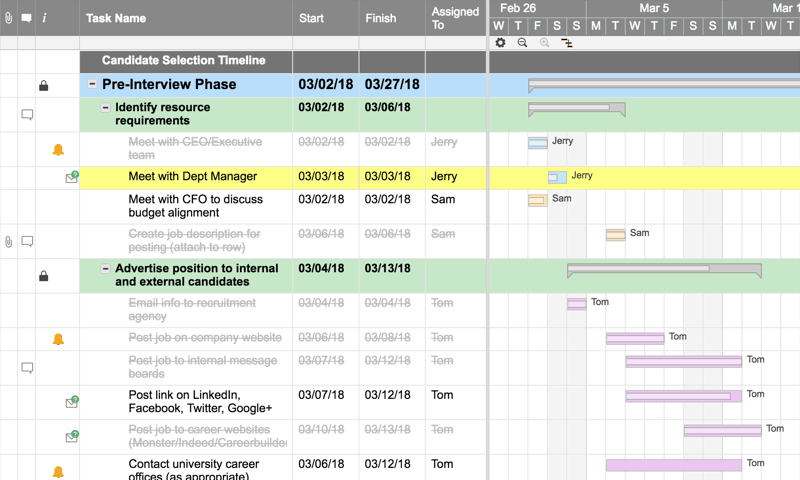 Ensure hiring initiatives stay on track with a real-time interview Gantt timeline. Keep key details in context by attaching them directly to the schedule. 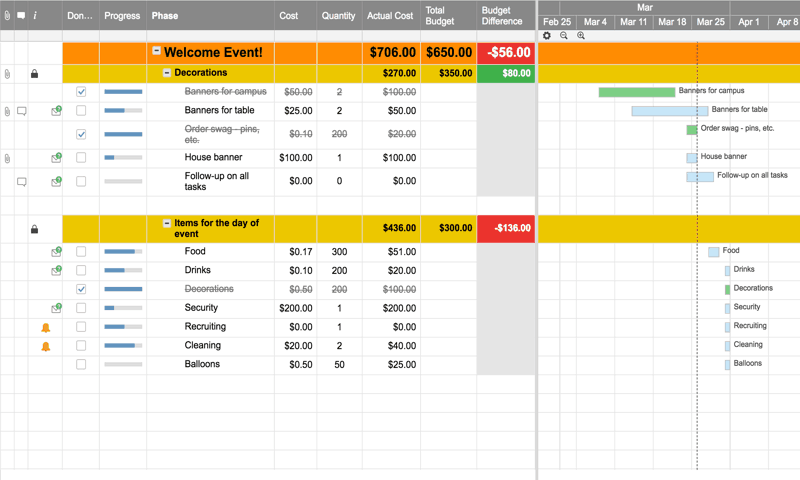 Schedule tasks, assign owners, and forecast budgets to ensure your events go on without a hitch. Centralize event details in one location accessible from anywhere. 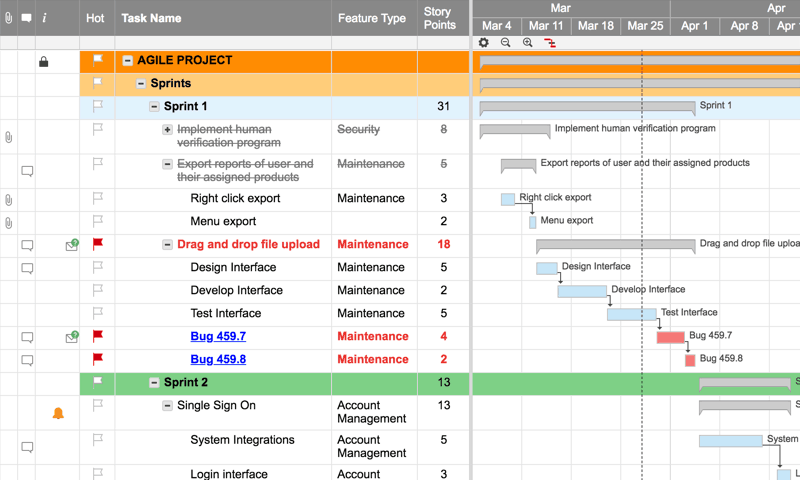 Keep project timelines on track with a clear view into progress in real time. Share your plan with clients and subcontractors to provide visibility into progress to all stakeholders. We can see changes at a glance, attach documents, and run reports for a quick snapshot of our progress. The ease of use and powerful collaboration features make Smartsheet a great tool to support key processes at World Vision International. How do I know which tasks need to be finished before others can start? With dependencies in Smartsheet, you can set when certain tasks need to be finished before others can start. Plus, with critical path, you can quickly identify which tasks need to be finished for your project to be complete, in just one click. How will a delayed task impact the rest of my Gantt timeline? Apply conditional formatting to give you a quick view into which tasks are at risk of being delayed, in order to adjust resources or dates to keep your project on track. As you make changes, your Gantt timeline will automatically adjust. Why use an online Gantt chart software? Originally, Gantt charts were created manually with magnetic blocks on a board or paper and pencil. 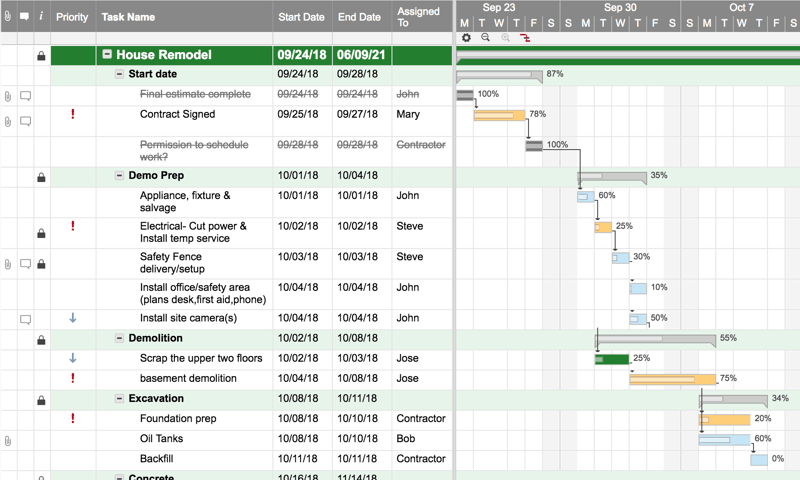 Now, with Gantt chart software, you get a real-time way to track & manage project timelines, share with team members, and make adjustments with reduced effort. Can I access my Gantt charts from anywhere? 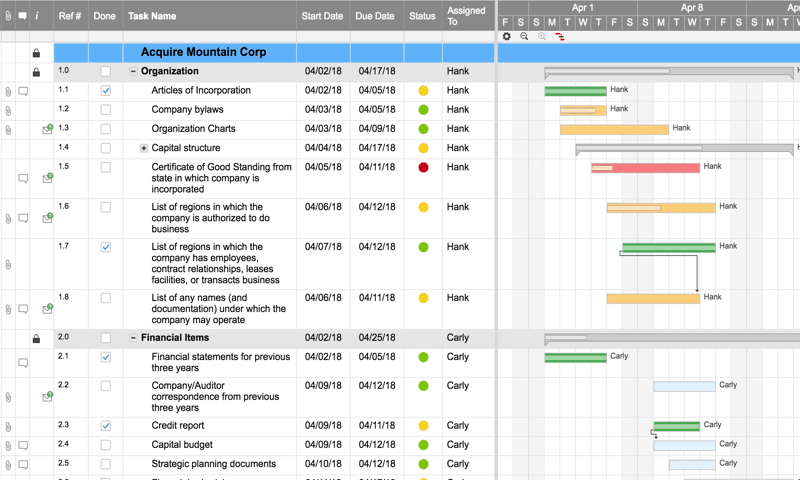 Online Gantt charts in Smartsheet empower you to access and manage your project timelines from anywhere at any time. Share your work with internal and external team members to collaborate on plans no matter where they are located. Does Smartsheet track changes in real time? All changes in Smartsheet are tracked in real time. Additionally, with Activity Log, you can see change history, including who has viewed a sheet, what changes were made, and when those activities occurred, all logged in one location. Can I start creating custom Gantt charts for free? With a free, 30-day trial in Smartsheet, you can start creating custom Gantt charts for your next project. It’s quick and easy, there’s nothing to install, and no credit card is required. 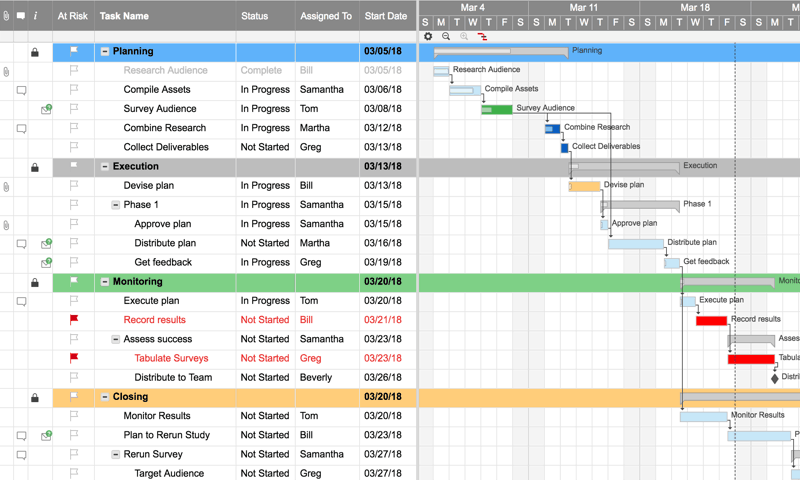 Start creating your Gantt chart in Smartsheet, today! 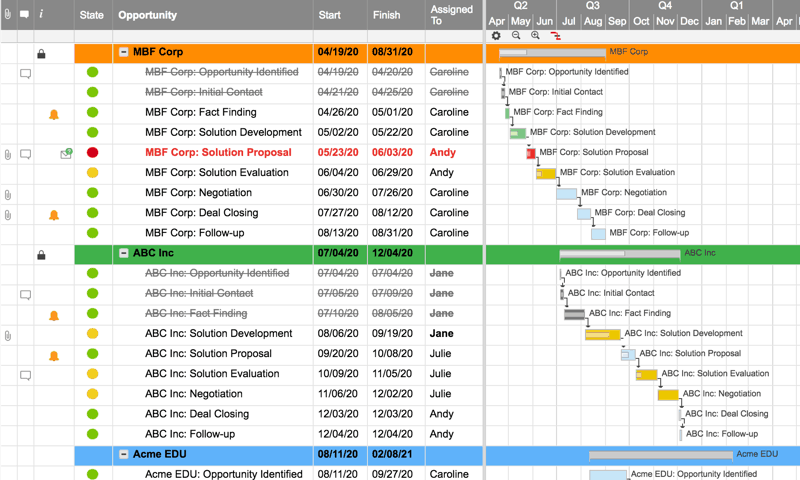 Discover a real-time, collaborative Gantt chart software with Smartsheet.